As evidence mounts for the efficacy of cannabis in treating PTSD, medical marijuana is fast being normalized in the veterans’ community. But the federal Department of Veterans Affairs is only beginning to demonstrate any tolerance on the question. This Veterans Day has occasioned a slew of media coverage for the efforts of military vets to secure cannabis to treat post-traumatic stress syndrome and other wounds of war. Some of the news shows fast-growing acceptance of use of medical marijuana by veterans. But there is much intransigence to be overcome — at both the state and federal level. In Illinois, more than 3,400 veterans have been approved for a medical marijuana registry card, state officials told CBS4. Among those is Shay Westhoff, who was awarded the Combat Infantry Badge and Bronze Star for his service in Afghanistan before a shattered neck forced him to retire after more than 15 years of service. It’s hardly surprising that one of the signs of mounting acceptance was reported from San Francisco, where cannabis dispensary Bloom Room, in the SoMa district, announced it is offering eighths of its “lab-tested medical-grade cannabis” for $1 to all veterans this Veterans Day. A very telling sign was the headline in a Military Times round-up of Veterans Day discounts: “Tall ship cruises, cannabis, workouts, burgers and more.” The story noted that Eaze, the California-based medical marijuana delivery service, is offering a 25 percent discount on cannabis products for vets with proof of service. The federal Department of Veterans Affairs — still popularly known as the VA, although it hasn’t been formally called the Veterans Administration since it was elevated to a cabinet-level post in 1989 — has only recently and tentatively started to bend on the cannabis issue. 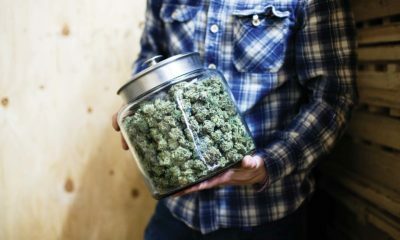 Under current policy, VA healthcare providers are prohibited from recommending that their patients use cannabis, or from helping their patients obtain cannabis treatments. However, under a policy change instated in 2010, veterans will not be denied treatment by the VA if they participate in a state-legal medical marijuana program. Under this reform, vets are also free to discuss their cannabis use with their VA healthcare provider without fear of repercussion. There have been efforts — both through legislation and litigation — to allow VA physicians themselves to prescribe or recommend medical marijuana. The main national organization pushing for this is the Veterans Cannabis Project. A recent write-up in Forbes noted efforts to pass the Veterans Medical Marijuana Safe Harbor Act on Capitol Hill, which would empower VA physicians to issue medical marijuana recommendations in states where it is legal. The bill, sponsored by senators Bill Nelson and Brian Schatz, would also make it legal for military vets to “use, possess, or transport medical marijuana” in accordance with state laws. Finally, it would mandate that the VA take up a study on “the effects of medical marijuana on veterans in pain” and the relationship between participation in state medical marijuana programs and any “reduction in opioid abuse among veterans.” The bill would allocate $15 million for this research. TELL US, do you think veterans should be able to access medical cannabis?